My copy of Songs of the University of Virginia, the Virginia Glee Club recording made in 1947 that I bought on eBay, arrived earlier this week. Between work and a million other things, I didn’t get a chance to listen to it until Thursday night, when I ripped the record to lossless AAC using my Griffin iMic and Amadeus Pro (see my earlier note on my increasingly unlikely project to rip all my vinyl records for pointers). And it’s a little different than I expected. First off, some new findings about its pedigree. As I posted earlier, University archives said it was recorded by RCA Victor, but the record cites “Recorded Publications Company” as the label. There is no further information other than an address in New Jersey. I did some Googling, and it seems that this was a not uncommon arrangement. RPC was kind of a vanity vinyl press for small markets like universities, and in at least one other case they published recordings that were actually made by RCA Victor engineers. There is very little on the record itself to help with additional clues about its provenance—no liner notes or even any text on the back cover, and no date. But a few clues are possible to deduce. First, this record is not the original format that was issued in 1947. There is a scan of the record in a UVA exhibit that shows the label, with only two songs on one side, not the four or five in the current pressing. 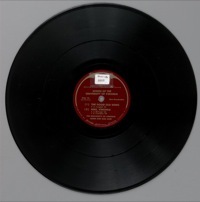 This is a simple mystery to solve, though: the university archives speak of a “three-record album”—in this case, they apparently mean album as in the original books of 78-RPM discs. This would mean that the first edition had three 78-RPM records in it, which has since been condensed to the current 33 1/3 RPM LP with nine total songs. The next task for this particular Glee Club alum is tracing the copyright of the recording. I can’t help but think that some alums of Mr. Jefferson’s University would be interested in checking out these recordings as CDs or downloads—and if that means that we could help make some extra dough for the group, all the better.